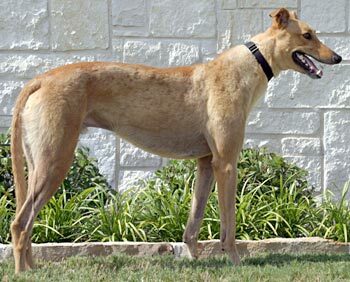 Ironman is a gorgeous 3-year-old red male, born August 1, 2006. His sire is Dodgem By Design, making his grand sire the late famous Gable Dodge, and his dam is GALT’s own Rooftop Pinny. Ironman is full sibling to Carmen, Mo, Tess, and El Dorado, and half-sibling to Custer, Sweetie, and Hot Rod. Ironman’s racing career was a total of 6 races, starting May 10, 2008, in Naples-Ft. Myers, and ending there on June 7, 2008. 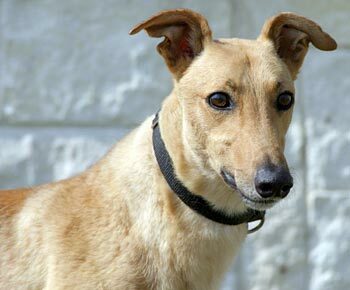 He was obviously never into racing, but is on the hunt for his forever home! 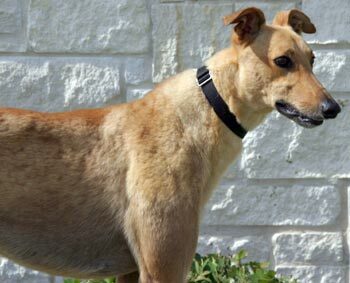 GALT is thrilled to have Ironman join his siblings in GALT’s family. Ironman's small animal test: Ironman is considered both cat and small dog trainable. He perked up his ears at first sight of the cat, but showed no interest after a sniff. He was eventually allowed to roam free without the muzzle or leash. Proper introduction and close supervision is always recommended when introducing your greyhound to small animals. What a charmer! Ironman is my nominee for “Mr. Congeniality.” Nothing fazes this incredibly sweet boy. He totally ignores our cats and is very tolerant of the antics of two very young, boisterous human foster brothers. His super-hero name suits him to a T. Nothing bothers Mr. Ironman! If one of the boys accidentally steps on him, he just ignores the intrusion, smiles his silly grin and keeps on wagging his tail. “Bring it on,” he seems to say! He may not be able to leap tall buildings, but don’t tell HIM that! He loves to run around the back yard, and sometimes I imagine him taking off in flight to save a damsel in distress. Ironman has adapted well to his crate and prefers to savor his meals and snacks in this nice, quiet personal space. He is not territorial, however, and he gets along quite well with our grey. He loves to hoard stuffies in his crate, but he’s happy to share them and doesn’t seem to notice if someone comes along and swipes one! This polite, clever boy figured out potty training and other house rules right away. He only tried to mark once, and he backed away immediately when he heard a firm “No!” from his foster mom. He has no bad habits – doesn’t whine or cry - never counter surfs or chews anything – doesn’t jump on people or get up on the furniture. What can I say? He’s Mr. Perfect – a dream date - and he’s just waiting to come home with YOU!